To some, art is the purest form of expression humankind can ever express. Where as to some others, art is nothing more than self indulgent clap-trap, solely for the egotistical and the obtuse! Yet, that said, to the likes of Charles Soule, Ron Garney, and Marvel Comics, its November, 2016, and it's time for Daredevil in review. TO QUOTE Jimmy Carr: 'Within the first few weeks of joining a weight loss group, like Weight Watchers, you find yourself just trying to find your own feet'. 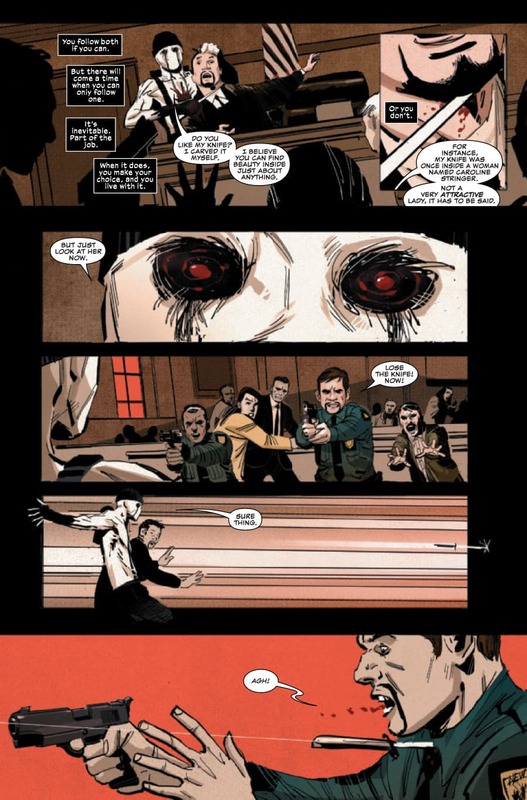 Some of you may recall that last months episode of Daredevil, issue 12, revolved around a tale that was easily divisible by three. And guess what? This month they're at it again, with a similarly structured episode that will allow me to tackle it, head on, one section at a time. Part One: Capture, But Not Release. Following on from last months adventure we begin this story with Billy Li talking to Daredevil on the phone, telling him about what he can see unfolding before his eyes. Specifically, Muse terrorizing the courthouse Billy's standing in, with additional emphasis placed on Muse wanting to kidnap the Judge. So what should he do? How should he act? If Billy puts on his Blindspot outfit he may get hurt, just like the many others who also surround him! Yet if he allows Muse to escape, well, at least that way he may be able to secretly pursue him from a distance, and keep tabs on him as he goes along! Yes. You guessed it. 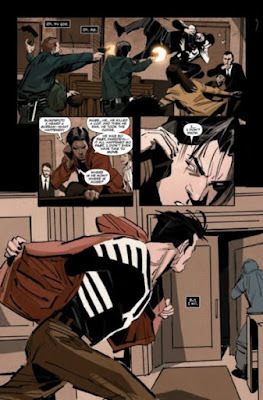 Blindspot chooses the latter of these two options, one which puts him in the right place, at the right time, to trail Muse all the way from the courthouse right down to the sewers. Part Two: Would You Like To Know How You're Going To Die? Once in the sewers, Muse drags the judge all the way to his murky hideaway, deep, deep, underground, and tells him as soon as he gets there how he's going to use his body to create a work of art, along with the rest of the people who he's already captured. Now from my point of view I thought this was a much needed scene within the scheme of things. 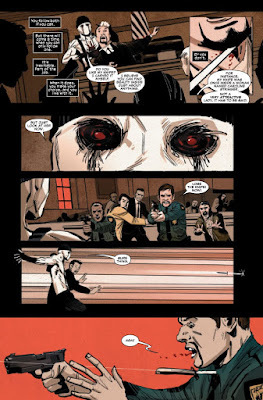 Not only did it explain more about the twisted way Muse's mind works -- all avant garde, bordering on the sociopathic -- but it also added a sense of suspense and danger to this tale, especially when you factor in that, ouch, Blindspot is on his own, with Daredevil elsewhere, unable to quickly swoop in and save the day! Now for fairly obvious reasons I can't tell you too much about how this tale ends. But that said, the one thing I can say is that... yes, Blindspot does manage to un-kidnap Muse's hostages, but does so without taking into account how robust he is as a hero. Well, for the sake of spoilers, let me allude to the fact that his outfit needs batteries to work properly. Batteries that, unfortunately for him, run out too quickly and at a very inappropriate time! Poor sod. But never mind, eh? At least he gave us one of the best cliff-hangers devised by this new creative team. Oh, and as I'm on the subject of both Charles and Ron, all in all I'd say this has been one of their best issue's to date. Charles' story-line mainly focused on Blindspot and Muse, giving us more of an insight on each characters motives and personality. Where as Ron's art, on the other hand, has a nice yet murky feel to it, and this is especially highlighted in those scenes down in the sewer, the dark, noir inspired sewer, full of atmospheric lighting and contrasting emotions. Anyway, that's enough for now. 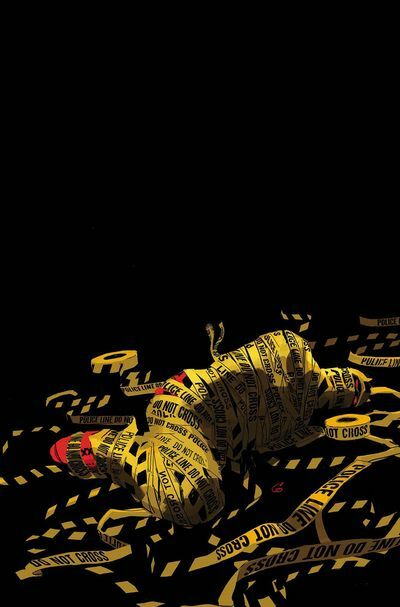 Overall I thought this was a pretty good issue of Daredevil. It told a suspenseful story and relayed a progressive character arc, all the while adding a dangerous element to the mix which is one part titivating, one part captivating, and all parts Daredevil -- minus the leading character. Why thank you Lionel Richie! Without you, my humor would be less rhythmical. Essentially this story is about a hero tracking down a monster who has kidnapped a group of people, with the intent of slaughtering them and making a statement out of their dead bodies. 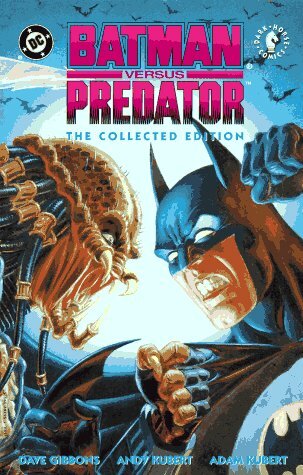 You know, just like in the comic book, Batman Vs Predator, although in this case more Marvel inspired than DC. Are you taking a selfie? Don't you find opticians overrated? Have you ever thought about changing your service provider?